Curious about the different digital marketing types? Digital marketing is a large word which houses a large number of marketing types and activities. Unless you’ve been living under a rock for the last decade, chances are, you’ve heard about the importance of digital marketing and all the benefits that come with it. But with a large number of marketing approaches falling under the digital marketing category, how will you know which you should use? Digital marketing has time and time over proven itself to be far superior over traditional marketing, but that doesn’t mean all digital marketing types will perform equally well for each brand, nor suit every brand equally well. With all of this in mind, digital marketing can sometimes feel overwhelming, to say the least. Especially if you’re just starting out. On top of that, there are a number of different terms that you may have never heard of, such as SEO, PPC, and SMM. Finding out the digital marketing types that are best suited for your brand doesn’t have to be difficult. And the first step to identifying which you should use is knowing what digital marketing types are out there, and which possibilities you have in using them. In this article, I’ll be listing all digital marketing types which fall under the category of digital marketing, explain them, and help you identify the ones that are best suited for your brand. Awesome, let’s dig right in. Search engine optimization, or SEO, fall under the category of search engine marketing, which, in turn, fall under the category of digital marketing. (Yes, I know, it’s hard to keep everything apart). This means that SEO is available for all businesses with a website. Now, if you’re new to SEO, it is the practice of optimising your website and the content on your website (as well as creating new pieces of high-quality content) to rank better on Google, and thus gain more website visitors who consists of targeted prospects who are relevant to your brand and thus likely to convert. Now, many brands use Google Adwords and pay to rank high for keyword search results, and this marketing tactic has shown to be tremendously effective, too, but the fact of the matter is that 94% of all the clicks in search results go to organic listings, not paid search results, which means that there is a huge potential here for brands. The SEO landscape has changed quite a lot over the years, as Google has updated their ranking algorithms, but the idea still remains the same. Now, many people approach SEO from the wrong angle and ask themselves ”how can we rank high on Google searches?”, rather than asking ”what is it that makes a search result rank high on Google?”. Despite the algorithms have changed over the years, Google’s main goal has always been the same since day one. To present the most relevant and high-quality search result for the searcher. And if you can make your website and the pages on your website to be just that, Google will favor you with higher rankings. If your content isn’t better than others people’s, Google has no reason to rank you better. Since the vast majority of brands now have a website, SEO truly is one of the digital marketing types that is for everyone. But despite this, not everyone is using it. Some don’t even know that it exists, and others don’t know how to do it. SEO doesn’t have to cost many dollars, if you do it yourself that is, but if you’re going to take help from a good SEO agency, you’re going to be looking at about $1000+ all the way up to several hundred thousand, depending on how extensive the work is going to be. Public relations is among the digital marketing types something that can’t be neglected. “Public relationships” is quite a large term which gives room for a large of things, but essentially, Public relations are all the efforts in marketing to give your brand exposure to the public. Naturally, and as a result of this, Public relations becomes a central part of digital marketing, as almost everything you do is done to give your brand exposure. 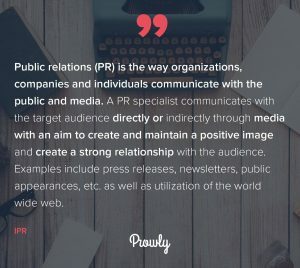 PR is a marketing tactic that is used by all types of brands, but it is especially crucial for new and small businesses. These businesses generally have a low brand awareness (for obvious reasons), and PR allows the brand to establish itself in the industry and become a brand that people think about when thinking about that industry. This does not, however, remove the fact that large brands should work with PR too, and no matter what type of brand you are, PR should, therefore, be a great focus. Since PR is such a broad term, the cost of this marketing approach varies heavily. The smallest PR effort is still considered PR, and this may not cost anything or just a few dollars, but the large PR campaigns, such as running ads on the Super Bowl costs millions. Social media marketing is one of the digital marketing types which probably has exploded the most in the last couple of years. Not necessarily being the largest, but it is definitely the marketing tactic which brands have started to implement into their marketing strategy more and more, compared to just a few years ago when very few brands were using it. Social media marketing is the practice of leveraging social media as a marketing tool in one way or another. There are, of course, a number of ways social media can be used if you look at it more practically, however, if you look at it on a macro scale, social media is where the attention of the audience is, and therefore, that’s where brands should be, too. Social media gives brands a direct connection channel with their audience and allows them to instantly interact with their audience in real-time to increase brand awareness, build relationships, establish trust, and much more. The brands that succeed with social media marketing understand that social media is more of a relationship tool than it is a promotions tool, because it is all about being social. People aren’t on social media to have ads shoved in their face, they are there to be social and to interact with people. This is why the brands that focus on using social media as a relationship tool generally find more success with it compared to those who use it as a promotional tool. With more and more people now using social media, it has become a tremendous tool for brands to reach a large part of their audience, no matter where in the world they are. And when they do, they can interact with them. This is something that isn’t possible to do in the same way using other digital marketing types. Social media marketing is suitable for almost all brands. Those brands that still haven’t embraced it, and are a bit skeptical about it often say that their target audience isn’t to be found on social media, but the statistics of the user demographics of social media proves that for the vast majority of brands, it’s just not true. Because the user demographics in ages, geographical area, gender, and more, are quite widespread. And the statistics about social media marketing proves that a lot of brands are finding amazing success from social media, too. Sure, if you’re a brand which targets 80+-year-olds, chances are, social media isn’t the ultimate platform you should be using, however, for most brands, the target audience is there. It’s just about how you identify and target it. 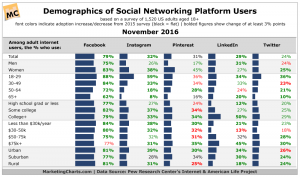 A trend is also that more B2C brands are using social media marketing, but B2B brands have also proven that social media works for them, too. The cost of social media marketing is, just like most other marketing efforts and tactic very different, depending on how you choose to use it. If you plan on using social media and manage everything by yourself, and then leveraging the organic reach on social media, you don’t have to pay a single dollar to generate results. However, if you’re going to let somebody else do it, you’re going to have to pay at least a thousand dollars a month. That number can then stretch all the way to several hundred thousand depending on what your objectives are, and what you are hoping to accomplish. Moreover, if you want to gain traction quickly and drive more results, you can also leverage the ads that are available on the different social media platforms, where you pay to advertise to get more reach in order to gain more traction and gain more traction quicker. All of these terms fall under the same category, which, essentially is a combination of all of these digital marketing tactics at once. A successful digital marketing strategy includes several of the digital marketing types, and if done correctly, the different digital marketing types support each other in one way or another. For example, if you just create a website and let it sit, the people who specifically search for it will find it and get the information about your brand that they’re looking for. 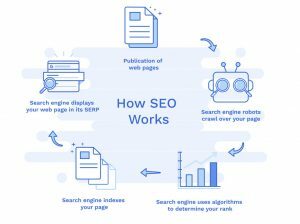 But if you include, for example, SEO, you’ll be able to drive more visitors to your website, and thus have your website drive better results for you. In that way, these digital marketing types support each other in one way or another, resulting in overall better marketing results. When it comes to the price of digital marketing as a whole, it is a very difficult question to answer, because the answer is that it all depends on what you do, and which of the different digital marketing types you focus on using. 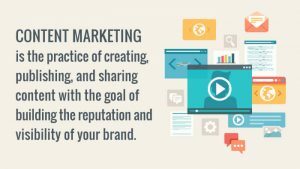 Content marketing is quite a broad term under the digital marketing umbrella, and it normally includes one or a few of the other different digital marketing types as well. But what is special about content marketing is that content is the central part of the marketing. In other words, content marketing means creating content which your audience will find appealing and which will bring them value in one way or another and then leverage that content to reel people into your business. Since the content you create in content marketing obviously has to be distributed somewhere, it naturally becomes a part of other digital marketing tactics, for example, social media marketing if social media is the place you use to distribute your content, or, your website, if your website is the place where you distribute your content. Content marketing is truly a digital marketing type that can be used in so many different ways and created in a way so that it suits each brand and their target audience. If you want to attract customers and prospects, you obviously need to have a value proposition, something that you use to attract your audience. And for brands, that value proposition is often times content. When it comes to the cost of digital marketing, it varies tremendously. Obviously, you can write a blog post and then upload it to a third-party site such as Facebook and then not have to pay a single dollar, however, if you are going to embrace the same content marketing strategies the major corporates are using, you’re going to be looking at a bill of at least a few hundred thousand dollars, all the way up to millions of dollars. Since content marketing is so tremendously broad and can include anything from one blog post a month, to tens of informational videos, several blog post guides, and multiple social media posts a week, the strategies between brands vary a lot, and therefore, the cost of the content marketing varies equally so. Influencer marketing is one of the digital marketing types which has skyrocketed in popularity the most over the years, and the reason for that is social media. Social media is the use of influential individuals on social media to promote your brand. That influencer marketing is new doesn’t really come as a surprise considering social media hasn’t been around very long. 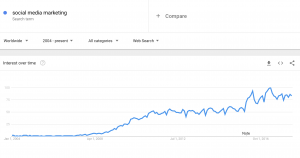 The truth is that ”influence marketing” has always been around. The only difference is that back in the days, people looked up to celebrities and leaders. But what social media has done is it has given everyone a voice, and virtually anyone to establish themselves as an authority and expert in their industry. Since influencers are individuals who are known to be experts within their specific industry, they come off as more trustworthy and authentic, as opposed to celebrities who might promote brands that they clearly don’t resonate with. This is the reason why the statistics of influencer marketing has proven to be so immensely impressive. Brands have a very low level of trust since everyone knows that everything they do and say is done to help them sell more. Influencers, on the other hand, don’t have the same agenda, and generally only promotes the brands that they truly believe in. This is why more and more brands rather than having themselves tell their audience how amazing their products are, partner with influencers and have them spread the brand’s message to them. Influencer marketing is mainly used by B2C companies, as the majority of fans and followers of influencers are consumers. But that does not, however, mean that B2B brands can use influencer marketing, as it can help you spread the word about your business to the right people through influencer amplification. The cost of influence marketing depends mainly on the influencer you partner with. If you partner with macro influences who have built a large following of millions, you’re going to have to pay at the very minimum a few thousand dollars, but on the contrary, micro-influencers (influencers with a much smaller yet targeted audience) might satisfy with just a product sample from you. The single most important thing in influencer marketing is that you identify authentic and genuine influencers who resonate with your brand. 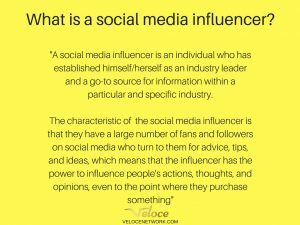 This is, of course, easier said than done, but with Veloce influencer directory, you can filter and search among hand-picked influencers, or have us identify suitable influencers for you, so you can be sure that you partner with the best possible influencers that will help you generate the best possible ROI. Affiliate marketing is one of the digital marketing types where you kick your feet back and let other people do your marketing for you. Affiliate marketing means getting people to promote your products and then every time they drive a sale, they get a commission off that sale. The great benefit of this is that there is no upfront cost, and you yourself don’t have to spend a single dollar on marketing (but just because you run affiliate marketing doesn’t mean that you should neglect your own marketing). Normally, the affiliates get personalized links which they used, and then if someone clicks on their link and makes a purchase, they get a cut from that sale. 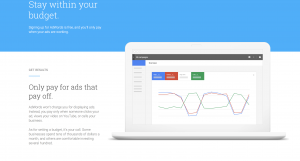 Through the personalized link, you can trace which affiliate has driven what sales. Affiliate marketing is most popular among B2C businesses, but the important part is that you are able to track who buys what and which sales come from which affiliate, and this is something that might be tricky for some B2B businesses, however, if you have a website where people can buy directly from, then you can absolutely use affiliate marketing. We humans spend more and more time on our mobile phones. In fact, chances are, you have your phone within five feet from you, don’t you? Think about everything you do on your phone. You use social media, you search the internet, watch videos on YouTube, and more. All of these are great places to reach customers. You just need to know how you can reach them. Now, the act of targeting people on social media, for example, normally fall under the category of digital marketing or social media marketing, but a digital marketing tactic that doesn’t fall under those categories is SMS marketing. SMS Marketing is quite old, or at least almost as old as the cell phone has existed, but it is certainly not the most popular digital marketing tactic. Ahh, the good old email marketing. I’ve personally lost count, but the fact of the matter is that email marketing still works, and it is driving brands great results, even though the open rate of emails has decreased over the years, as more and more brands have started filling customers’ email mailboxes. Email marketing gives you several marketing benefits, and an important one is that it allows you to stay in touch with prospects and existing customers and ensure that they make their way all the way down your sales funnel. By sending emails to your prospects you ensure that your brand is never forgotten and always on top of their mind, and it also allows you to build your relationships with your customers. 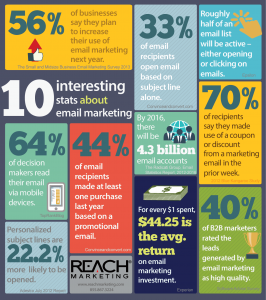 Of course, if email marketing is going to be successful, you need to do it in the right way. Sure, you can just buy a large email list and then blast out emails to them, but that won’t generate very great results if any, because those individuals aren’t relevant to your brand. But by working with email collection, you have individuals who have shown a genuine interest in your brand, and therefore., they are much more likely to convert. Viral marketing is the digital marketing tactic where you focus an work towards getting your content in your content marketing to go viral. Of course, it’s much easier said than done, but by taking the right actions, you can significantly increase the chances of having your content going viral. Going viral on social media, which means that your content is spread and shared across social media like a virus (thus viral) and gaining a tremendous traction, can make your brand an overnight success. There are a number of brands who have successfully gone viral, and my favorite example is Dollar Shave Club which created and shared a promotional video which went viral. As a result of their viral video, the brand gained an immense amount of exposure and lots of press coverage. The result? Dollar Shave Club was then purchased by Unilever for $1B – just 4 years after the video went viral. Of course, to go viral, there are a few preconditions that have to exist first. Firstly, you have to have content that is viral-worthy. This means that in order to work with viral marketing, you need to work with content marketing first. If you don’t have any content, you don’t have anything to go viral with. Another precondition for going viral is that you’re unique. Millions and millions of pieces of content are being shared on the internet every single day, and this makes cutting thought the noise incredibly difficult. Therefore, if your content isn’t different from all of the other content that’s being shared, your chances of going viral are minimal. The vast majority of content that has gone viral has been focused on humor, and this is something that is worth having in mind when looking to craft your next piece of content in an attempt of doing a homerun. With the immense exposure that comes with going viral, it is a digital marketing type that is relevant to all businesses and many marketers’ dream. Of course, creating something that is supposed to make you go viral means putting yourself out there and doing something that others aren’t, and for many brands, especially the brands that are very proper and have a bring brand personality, this is something they can’t imagine themselves doing. B2C brands have generally found more viral success due to the simple fact that consumer products generally reach a larger audience compared to what B2B do. But this does not, however, mean that B2B brands can’t go viral. The best part is that if you do it all by yourself, viral marketing can be completely free. The cost of distribution of your content is free now that you have social media platforms at your disposal, and if you have the skills needed to create viral-worthy content, you can manage it all by yourself. Pay per click is among the most popular forms of paid a digital marketing types. As the name suggests, it means that you ”pay per click”, which means that every time someone clicks on your ad, you have to pay. This type of advertising generally drives better results than traditional marketing as you’re only paying for the results and if someone clicks through to your website. There are several types of pay per click marketing, but the principle of only paying when someone clicks on your ad obviously remains. One of the most popular forms of PPC advertising is Google Adwords. These are ads located at the very top as well a the very bottom of search results on Google, which ranks for the keywords you’ve set to rank for. Since you yourself set the budget of how much you want to spend, PPC marketing is very accessible and can be used by all types of brands. Because the fact of the matter is that everyone search for things on search engines, and if your brand is in the search results when a prospect searches for your industry, or something related to it, you can show up, and (hopefully) get them to convert. Pay per click advertising is tremendously effective, especially on search engines, not only because you’re only paying for the clicks that are generated, but you also select the keywords you want to rank for and thus ensure that only the most relevant prospects click on your ad. However, if you don’t know anything about setting up a PPC ad, it’s important that you learn first because the ROI and cost of your ad are highly dependent on the way it is set up. If you know how to optimize it, you can generate incredible results by attracting qualified leads, and do so at a very low cost. It’s safe to say that the internet has completely revolutionized and disrupted the marketing landscape. Due to the sheer size of the internet, as the internet has evolved, it has given birth to many different digital marketing types which all, if used correctly, have proven to help brands generate amazing results. Marketers don’t have to limit themselves to just one digital marketing tactic, however, using them all can be a little bit overwhelming, but with enough resources, certainly not impossible. Do you think that I missed one of the many digital marketing types? Let me know in the comments and I’ll add it! Which of these digital marketing types are you currently using or have been using? I’d love to hear about it!